Nov. 24, 2004 – Wednesday. Memphis to Tucson and Tubac, Ariz.
other early morning travelers queued up at the America West check-in counter. The day before Thanksgiving is usually the busiest day for airline travel in the year and this day was no exception. We just didn’t expect the crush to start before dawn. The Arizona-based, discount airline operates a few flights from Memphis to its hub in Phoenix. There must not be enough business to warrant an investment in ground support staff and equipment; Continental handles the check-in arrangements. Unlike in Tucson or Phoenix, America West does not have curbside baggage check-in or the self-service kiosks in Memphis that make travel easier. That meant Betty had to pay a porter to lug my golf clubs and other luggage to the counter while I parked the car. There are lots of neat places to visit in and near Tubac including historic Spanish missions, excellent golf courses, wonderful displays of Southwestern art and crafts in the shops of Tubac Village, and bargain shopping at the easy-access, border town of Nogales, Mexico. On previous trips we had sampled most of the nearby attractions. We decided to focus this five-day stay on just a few things we really enjoy doing and seeing. Making this trip even more fun is the fact that our son will be joining us for four days. Plus, one of my golf buddies and his charming wife - Curtis and Kathy Downs of Memphis - are in Tubac for the week. Notwithstanding the tight seating, I was impressed by the efficiency and hard work of the America West staff and the Continental ground crew that helped them in Memphis. Our 8 a.m. flight to Phoenix took off at 8:30 a.m., due to a gate change and delays in getting a full planeload of passengers checked in and onboard. The only food served on the three-hour flight was tiny bags of hard pretzels. But that is commercial aviation today, with the airlines paring expenses and staff at every opportunity to stem the flow of red ink. Despite the delay in take off, we arrived 10 minutes early. Our son, Casey who lives and works in Metropolitan Washington DC, had arranged to fly from Baltimore-Washington on America West so we could meet at the Phoenix airport. The scheduling gambit – which saved him the cost of a rental car – worked as we arrived within 30 minutes of one another. Our connecting flight to Tucson – also on a Canadair regional jet – was delayed by heavy traffic by 30 minutes. The flight took only 22 minutes. Overall I was impressed with America West – which offered a slightly better schedule and fare than Northwest, American or other airlines for this trip - and would not hesitate to use the airline again. navigate. It was only a short walk from the gate to the baggage area and from there to an adjacent parking garage, where we picked up an Avis rental car with no delay. Our car was a four-door Chevrolet with a trunk big enough for my and Casey’s golf clubs plus all our bags but one. Somebody at the airport gave us directions to a nearby McDonald’s, which was a necessary stop because of our foodless flights. 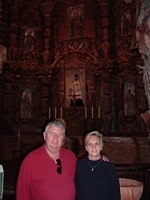 The next stop was at the “White Dove of the Desert,” a nickname given the beautiful Mission San Xavier (pronounced in the Spanish style, “ha-vee-yay”) del Bac on the outskirts of Tucson. The magnificent, Spanish-Moorish style, domed structure is painted a brilliant white. It rises from the desert and can be seen for miles. It is one of 20 in the southwest that were founded by Spanish missionaries led by the Jesuit Father Kino in the late 1600s; each were roughly a day’s journey apart. Casey, 29, didn’t seem to be as captivated by the renovated frescoes, intricate woodcarvings and painted statues as Betty and I were on this and previous visits. 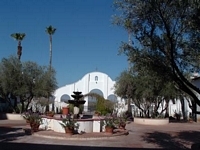 He lived a few blocks from the equally grand Mission Santa Barbara and visited a number of other Spanish missions on the El Camino Real while working in Southern California in 2001. He’s also traveled to Spain and to several Latin American and South American countries. Driving south on Interstate 19, we passed by the huge, open-pit copper mine operated by ASARCO, a mineral discovery firm. It is at the retirement-commuter town of Sahurita, about 20 minutes south of downtown Tucson. Betty and I had visited the mine on a previous trip and marveled at the monstrous trucks and terraced excavation areas. We also passed but did not stop at the Fred Lawrence Whipple Observatory, a joint venture of the Smithsonian Institution and the University of Arizona. It is one of the places we’ve wanted to visit but have yet to make the time to see. It is perched high atop the bleak and arid Mt. Hopkins. The 8,550-foot elevation, distance from city lights and the thin desert air mountain make for fabulous daytime and nighttime views. Observatory. With 22 specialized telescopes, the facility is the world’s largest for stellar, solar and planetary research, according to National Geographic. Also in the vicinity is the Palominos Observatory and Skywatchers Inn, a unique B&B that offers its night-owl guests an observatory and planetarium. I somehow missed the turn for Green Valley, a retirement/golf community about halfway between Tucson and Tubac. We had planned to stop at one of its shopping centers to purchase food and drinks. Betty and I had looked at several condos in Green Valley on our last trip to the area three years ago. The residential housing prices are amazingly low due to cheap land. We had decided that we are not ready to buy a second home in a “seniors only” development – as attractive as I think we’d find the desert lifestyle during the depth of Memphis winters. We stopped for supplies at a well-stocked grocery store we’d patronized on previous trips to Rio Rico, another resort about 10 miles south of Tubac. Rio Rico offers a Robert Trent Jones-designed golf course, horseback riding through stands of Palo Verde trees along the Santa Cruz River and even closer proximity to shopping in Nogales, Mexico. 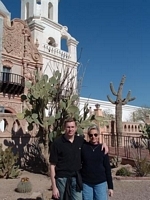 We had stayed in the resort hotel there twice in the 1990s before discovering the more elegant and spacious accommodations at Tubac Golf Resort. Tubac costs more but it’s worth it, we’ve found. A Colorado-based developer recently purchased Tubac Golf Resort. A $45-million renovation and expansion is underway. During the ownership and management transition, my golf tee time reservations for Thanksgiving Day plus the following Saturday somehow got lost. I was more than a little miffed when the golf staff reported the course was fully booked. I had made the tee times several months before. The front office staff politely but firmly intervened with the golf shop staff and my missing reservations were quickly restored. an opportunity to demonstrate just how committed Tubac Golf Resort is to making things right. The golf shop staff went out of their way to welcome us when Casey and I visited the driving range later that afternoon. I was pleased with everything except how I was hitting balls. We had the range to ourselves. The late afternoon temps were starting to drop from the low 60s. The sun was shining and the sky was cloudless and blue. The low angle of the sun to the south at this time of year produces an oddly dimmed light, making it hard to spot a golf ball on the fly or on the ground. Betty took some photos and spotted a Scarlet Tanager, with bright red feathers. Curtis and Kathy Downs had arrived at the resort the previous Sunday. We learned they had already visited Nogales and toured nearby Tombstone (he is a student of the shootout between the Earps and the Clancys at the OK Corral). We confirmed our plans to play golf, have Thanksgiving dinner together and later enjoy a fireside drink in our Casita the next day. Betty, Casey and I ate in the resort restaurant. My salmon was excellent, as was Casey’s filet mignon. Betty’s chicken was way undercooked and, once again, my complaint was quickly addressed. The manager sincerely apologized and gave her another plate of food and comped her entire meal. We have a two-room Casita suite that is nearly twice the size of our small condo in Gulf Shores, Ala. (Our condo complex was ripped pretty bad by Hurricane Ivan last September, the main reason we are spending Thanksgiving in Arizona rather than on the Gulf of Mexico). Casita No. 104 is quite comfortable, reflecting the quality of construction and furnishings that justify premium rates. It includes a separate kitchen with stove and refrigerator; a large bedroom with two queen beds; and a very spacious, well-appointed living-dining area with a big couch that makes into a queen bed, two reclining easy chairs, a secretary with fold-up writing table, a table with four leather chairs, and a big cabinet that holds a large TV and plenty of room for storage of suitcases, etc. The TV has satellite dish channels, a great improvement from our previous stays when only local stations were offered. This particular Casita is even nicer than the one we stayed at once before. It is roughly twice the size of the single-room Posada we had for another trip. This one has a private, walled patio courtyard in the front and a small porch-patio in the back with additional seating. The surrounding landscaping is manicured. Roses, petunias and other summer flowers are still flourishing. Lots of irrigation make the pampered lawns as lush and green as the grass in Ireland. We are only a few steps from a heated swimming pool and an in-ground, hot tub with volcanic-force bubbling action. The nicest thing about our Casita is its large, elevated fireplace. The resort provides as much mesquite wood and fire starter sticks as guests want, at no charge. We enjoyed a fire every night. Whatever heat comes to the desert during the day quickly disappears at night. The temperature got down to 31 degrees early this morning. The forecast calls for the high to climb into the upper 60s tomorrow. It’s going to be a great day for golf. It’s terrific being back at Tubac.